One of the most serious types of personal injuries is a spinal cord injury. They can occur from either a traumatic injury to the area, or a non-traumatic injury or illness. Spinal cord injuries ultimately affect everyone differently. But there are some important steps you can take to make living with this type of injury a little easier and a little more manageable. If you are suffering from a trauma to your spinal cord, or know someone who is dealing with this type of injury, then you should understand that you are not alone. According to the National Spinal Cord Injury Statistical Center in Birmingham, Alabama, roughly 12,000 new instances of spinal cord injuries are seen every year in the United States. 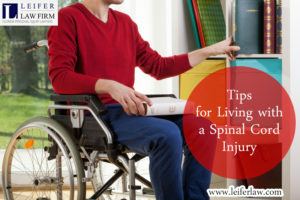 It is also a well-documented fact that spinal cord injuries seem to be most prevalent among young to middle age adults, with the average age of those coping with a spinal cord injury being about 42 years old. As far as gender, the majority of cases occur among males. Most of those suffering with a spinal cord injury do return to their homes or residence prior to the trauma, with only about 13% requiring admission to a nursing home or long-term care facility. Why are these facts important, you may be asking yourself? Because it is essential to realize you truly are not alone, and there are a number of people dealing with the same day to day living challenges that you may be facing as you cope and recover from your injuries. But a trauma to the spinal cord is a very serious injury, and its effects may result in some daily issues that you view as a personal loss. And to many, an injury such as this truly does result in several types of loss. Any type of loss can leave you with many confusing and overwhelming emotions. These feelings are perfectly normal, and are a part of the grief process that many people experience when dealing with any type of serious personal injury. However, it is also critical that you process and work through these emotions, and do not let them control you. Talking to others with spinal cord injuries, joining a support group, or speaking with a professional counselor are great ways to deal with these feelings. It’s important not to let any negative emotions interfere with your rehabilitation or adjustment, or allow you to make unhealthy decisions. Despite this injury, you are still in control of your healing and your body. Your injury may or may not result in a lengthy hospital stay. But you will get to return home and resume your activities of daily living. This typically results in some adjustments to your living quarters, based on your needs and the impact your particular injury has had on your mobility. Make sure you discuss with your doctor, caregiver, and occupational therapist any recommendations that they may have for when you return home. These modifications can make a huge difference in how easily you will be able to resume your daily activities. Many of those dealing with a spinal cord injury also deal with some type of pain, whether it is chronic or acute. Whatever you do, do not try to ignore your pain, or deal with it on your own. Your doctor or occupational therapist is there to help you cope with this, and to learn proper pain management techniques. Trying to ignore it, tough it out, or deal with it on your own can ultimately slow your recovery and rehab. You can learn to adapt to whatever loss of mobility you may be facing in time. In some cases, with rehabilitation, the loss of mobility may not be permanent. In other situations, the injury does result in permanent loss of movement that requires a lifelong adaption. Remember, life after a spinal cord injury does not mean the end of life as you know. It’s simply about being patient, and learning to adjust to your new situation. Communicate your feelings, both physical and emotional, to those around you and those assisting in your care. You’ll find, in time, this can speed up your road to recovery and adjustment to your new way of living.